KP Oli shakes hand with Prachanda after the prime minister announced his resignation at the parliament in Kathmandu, Nepal (July 24, 2016). Nepal’s Prime Minister KP Oli has stepped down as a key coalition partner, the Communist Party of Nepal (Maoist-Center) led by Prachanda, withdrew support for the government. Nepal’s parties are bracing to form a new government, which will be the ninth in the last eight years. The government led by Oli of the Communist Party of Nepal (Unified Marxist–Leninist), which was formed soon after the promulgation of Nepal’s constitution, has served for nine months. The frequent changes in government in Nepal have badly hampered the country’s development and economic growth. Even after the constitution’s promulgation, there is no sign of political stability in Nepal. The game of government toppling and forming still dominates the national political arena. Now there will again be a change in government. The Nepali Congress and Prachanda’s CPN(M-C), which joined forces against the current government, have agreed to hold the leadership of government on rotation basis. As per the agreement, Prachanda, a former rebel who became prime minister in 2008 and resigned in 2009 over differences with army, will become prime minister for nine months. Then he will have to hand over the reins to Nepali Congress President Sher Bahadur Deuba. Oli’s days have been numbered for some time, as CPN(M-C) demanded leadership of the government. In May, Prachanda and the Nepali Congress had reached an understanding on overthrowing the government. But Prachanda backtracked from his position at the eleventh hour after Oli assured him the post of prime minister. Oli agreed that government leadership would be handed over to Prachanda once the annual budget was presented and endorsed by Parliament. 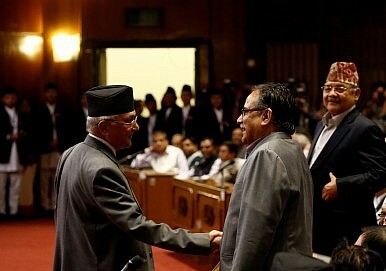 This sort of agreement is known as a “gentleman’s understanding,” a catchphrase in Nepali politics. Now, however, Oli is saying that there was no such agreement, which invited friction among the coalition partners and put the government in danger of collapse. After Oli refused to hand over the premiership to Prachanda, the Maoist leader withdrew his support for Oli. Once again, CPN(M-C) and NC made an alliance to topple the Oli-led government. “PM Oli monopolized the government functioning and he did not pay attention to implement the agreement reached with us, including a gentleman’s agreement to hand over the leadership to us,” Prachanda said in Parliament in a discussion over the no-confidence motion filed against Oli. The same type of gentleman’s understanding between the Nepali Congress and Oli’s CPN-UML last year was one of the most disputed issues of national politics. As a result, relations between the first and second largest parties in Parliament still remain sour. NC, which holds the most seats of any party, felt isolated as the major posts — prime minster, president, and speaker — are held by CPN-UML and CPN(M-C) under the current ruling coalition. Under Oli, the largest party, the Nepali Congress, was outside the government. Now, the second largest party, the CPN-UML, will be on the outside looking in. As the major parties remain busy grabbing power, vital issues are overshadowed. This has been the story of the last five years. Due to the frequent government changes, it took seven years to draft a new constitution and six years to complete the peace process. Due to power struggles, the Constituent Assembly (CA) elected in 2008 was dissolved in 2012 without delivering a new constitution. These are just the political causalities of power tussles; the country’s social and economic sectors were badly hampered as well. After the promulgation of the new constitution last year, there was an expectation among the people that Nepal would embark on a journey of political stability, resulting in economic growth and development. But those expectations have been trashed as the political parties are still first and foremost vying for power. Due to the lack of political stability, economic growth has completely stalled, triggering unemployment which pushed millions of youth abroad to search for jobs. According to government reports, every day 1,500 young Nepalis go abroad seeking employment due to the lack of opportunities at home. With the political situation uncertain, foreign investors are reluctant to spend money in Nepal. Domestic industries are facing a lot of challenges due to the political situation. Along with this, Nepal is yet to heal the wounds of last year’s earthquake, which claimed the lives of nearly 9,000 and left millions of people homeless. Though government has started to provide money to construct new houses, most people have yet to receive the funds. Thanks to the painfully slow rebuilding process, people are still living in temporary shelters in the rainy season. Health and education facilities are still left in ruins, but there have not been sufficient efforts to cope with those problems. Aside from rebuilding, Nepal’s main priority is the implementation of the constitution adopted in September last year. But there has been very little or no progress in that field either. To implement the constitution, Nepal will need to address the demands of Madhesh-based parties. But in the last six months there has not been any sincere progress between the major parties and Madhesi parties of southern Nepal. Last month, the Madhesh-based parties protested in Kathmandu in order to make their voices heard. Without addressing the demands of Madhesh parties, it seems that it will not be possible to hold elections as called for by the constitution. But there is a sharp division between the major parties and Madhesh-based parties, mainly centered on the boundaries of federal states in the southern part of the country, bordering India. The Madhesh-based parties want two provinces in the southern belt of Nepal but major parties are not ready to accept this demand, fearing that it might lead to the disintegration of the country. Instead, the government maintains that the issue is resolved. “The constitution has been already addressed to meet the demands of Madhesh-based parties,” outgoing Prime Minister Oli has told Parliament. Without addressing the demands of Madhesh-based parties it would be very hard to maintain stability in the country, which again affects development and economic growth. Implementing the constitution is not the concern of the major parties; what they want is power, in order to bolster their own positions. As per the constitutional provisions, Nepal should hold national, provincial, and local elections. The hidden agenda is that the major parties — the Nepali Congress, CPN-UML and CPN(M-C) — want to hold those elections under their leadership. Madhesh-based parties and other fringe parties also want their piece of action. The current tussle is aimed at securing the leadership of government during the elections. All parties prefer to be in government during election season because they are accustomed use state power and resources to bolster their candidates and win more position. Madhesh-based parties are also expecting a change in government, with the expectation that the new government would be more favorable to them. There is a real danger for Nepal should the current power struggle continue and the parties fail to unite when it comes time to hold elections. If elections are not held within the next 20 months, the chances of a political and constitutional crisis are high. Ordinary people are not concerned about who will come to lead the government but there is worry across the board that political instability has badly affected every sector in the country. The country has been riding a wave of political chaos since Maoist rebels launched their war in 1996 — two decades of political instability. Nepal’s larger neighbors also seek to influence the political turmoil to their own benefit. China reportedly strongly backed the Oli government, as it signed a trade and transit treaty with China ending India’s monopoly. Similarly, there were reports that India wanted to see the Oli government toppled. Though it is difficult to ascertain the degree of interference, India has huge influence in the internal political affairs of Nepal and China too is increasing its influence among the political parties and other key institutions. Despite the promulgation of the constitution, it seems that Nepal is doomed to face further political instability. Unless the major parties come together, there cannot be progress on addressing the key issues facing the country, whether rebuilding after the earthquake, implementing the constitution by holding layers of elections, or simply growing the economy. Kamal Dev Bhattarai is journalist from Nepal who frequently writes in international media about politics and social issues. He has recently written a book about Nepal’s peace and constitution drafting process tiled Transition: From 12-Point Understanding to Constitution Promulgation. Can Nepal Find Political Stability? As Nepal gears up for parliamentary elections, its citizens want two things: stability and development.